Product #15701 | SKU EW-4537 | 0.0 (no ratings yet) Thanks for your rating! 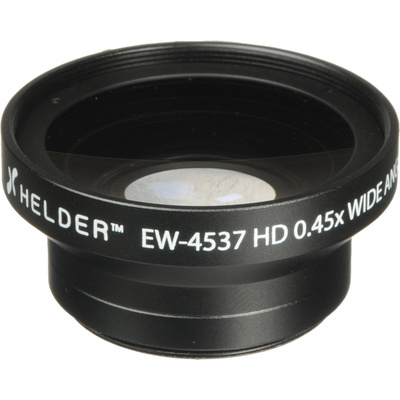 The MW-4558 58mm HD 0.45x Wide Angle Conversion Lens from Helder provides 0.45x magnification to any 58 mm lens, for wide-angle shooting. Whether you're shooting landscapes or working in tight spaces the MW-4558 opens up the scene and allows you to get more into your frame. Attach the conversion lens to the 58 mm front thread on your lens and start shooting. You can even attach 82 mm filters onto the front lens mount for added protection and image quality. Having 0.45x magnification means your focal length will be cut nearly in half, widening your camera's field of view and giving a much wider perspective. Screw this onto the front end of your currently attached lens and the MW-4558 will transform your camera and lens from a standard or telephoto to that of a much wider angle. 82 mm Front Filter Thread Add any 82 mm filters to this conversion lens for increased protection and creative effects.